Details matter so much. Think of a house that looks clean, but doesn’t really feel clean. It’s because of those grit-filled corners that were missed by a broom, the greasy kid fingerprints on a glass door, or the gunk that accumulates around the drain. Paying attention to these small details can transform your house from tidy to spotless, and make a big different to your mental state. So, the next time you’re cleaning, take note of the following often-overlooked spots. Make sure they’re scrubbed and dusted, then enjoy the sense of total spotlessness that ensues… until the next cleaning day, of course. These get handled multiple times a day, and yet get wiped down much less than, say, a countertop or table. Be sure to give these a spray with vinegar and water, then wipe aggressively with a cloth. Once, I wiped down the stair bannister and my cloth came away black. I realized in horror that this was something I should clean more often. Give it a spray with natural cleaner and wipe thoroughly with a cloth. Curtains collect dust over time, both from within the house and by blowing through an open window. Depend on their weight, vacuum with a fabric attachment or toss in the laundry for an annual refresh. Same goes for shower curtains; always buy fabric ones to avoid the off gassing from plastic, and launder occasionally. Always let it dry outside the tub/shower after use to avoid mold growth. Run your finger along a lamp shade and you might be shocked at the line that’s left. Whether it’s a fabric shade or a wall fixture, these require regular dusting with a dry cloth. This is a nasty area that deserves regular attention. Food bits might miss the trash, especially when kids are doing the dishes, so be sure to pull out the bin, vacuum and wash all around, and deodorize with baking soda if needed. Wash and air out the trash can in the sunshine whenever possible. You don’t see the upper surface of fan blades, so these are easy to forget. Over time they pick up cooking grease (if in the kitchen) and dust, then spray it all over when turned out. 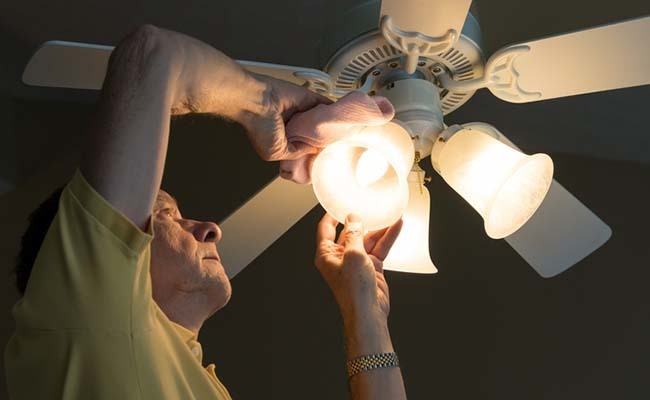 Give fan blades a good wipe-down with mild detergent. What is it about under-sink cabinets that makes them such dirty junk traps? A cleaning professional once told me this is the place she tackles first, and she’s right that it makes a big difference. Clean out the sub-kitchen and bathroom sink areas, creating space and collecting loose stuff in boxes and caddies. When a framed painting or photo gleams on the wall, it looks wonderful. Be sure to dust these regularly, especially on the top surface and the front glass. Wipe down any display surfaces and items sitting on them. People often forget to clean the very tools that they’re using to clean. Make it a habit to toss rags and mop heads in the wash after every cleaning session, otherwise you might end up spreading old dirt and bacteria around as you go.